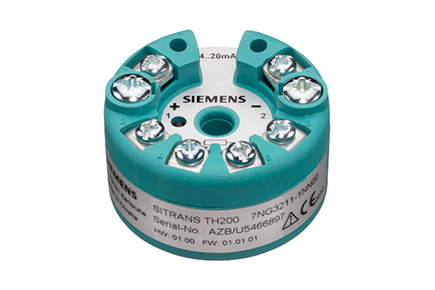 The Sitrans TH200 Temperature Transmitter is designed to support all common RTDs, thermocouples, resistance and millivolt-sensors. Setup is quick and easy with the transmitter-modem and SIPROM T software. This configuration tool can be downloaded free. Unique user-friendly details are implemented: Without opening the 4-..20mA loop, the output current can read directly with a multimeter. A red/green LED shows the technician the status at a glance.